on the woodside. 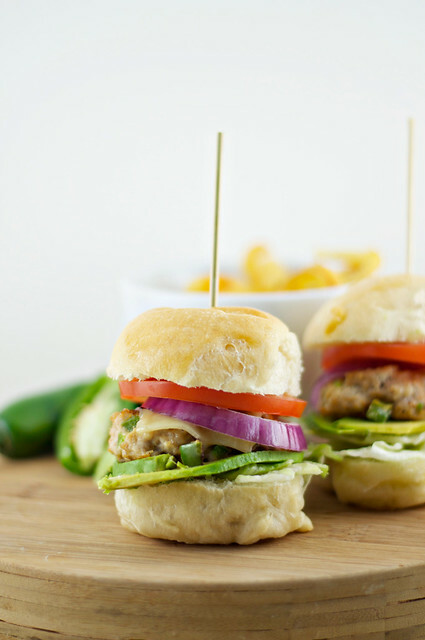 : *popper sliders. True confession time? Cooking burgers makes me nervous. In the interest of full disclosure, actually cooking protein of any kind makes me apprehensive. I have over- and undercooked, at various times, chicken, pork, steak ... pretty much every delicious meat you can think of. Overcooking makes me sad, to be sure, but undercooking is the worst. And being afraid you're not going to cook something past the point that it could kill your friends and family doesn't make for a particularly pleasant in-the-kitchen experience. Problem 1: I love a juicy beef burger, but I don't want to dry out the beef by overcooking, or poison my guests by undercooking. Solution: Make chicken burgers! It is absolutely necessary that chicken be cooked all the way through to be safe to eat, so you won't be overcooking it, just accomplishing what is required of it. Problem 2: Won't a ground chicken burger be awfully ... dry? Solution: Make cream cheese–chicken burgers. I don't know what compelled me to use cream cheese to accomplish that, but it could have something to do with my theory that cream cheese cures everything. Problem 3: Won't a ground chicken burger with cream cheese be awfully ... bland? 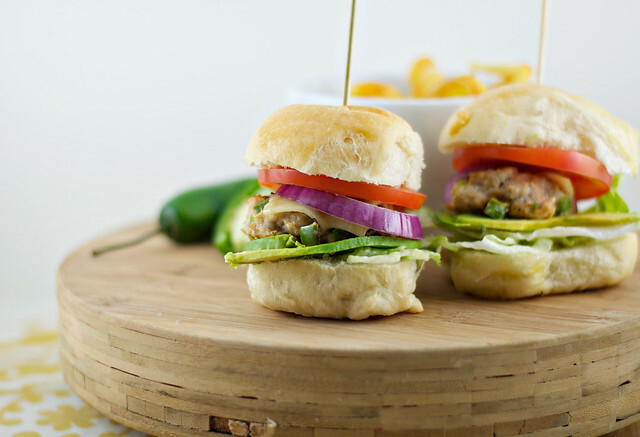 Solution: Make jalapeño popper chicken burgers. Spicy, creamy, crunchy—how can you go wrong? Then I just topped off the patties with all the yummy things I love: bright white Cheddar, crisp iceberg, smooth avocado, sweet tomatoes, and punchy onion slices. I got the slider buns in my major big-box grocer's bakery—they were labeled "Use us for sliders!" which made them easy to find. Any small roll will do, just make sure to form the patties to about the right size for your particular buns, hun. 1. Mix together first 5 ingredients in a medium bowl; working quickly, form mixture into 8 even patties. 2. Heat oil in a medium skillet over medium heat; add patties and cook, pressing down with a spatula, about 3 minutes on each side or until golden brown and cooked through. 3. Layer lettuce and avocado on roll bottoms; top with burgers, cheese, onion, tomato, and roll tops. Makes 4 servings. yummy cant wait to make this! u put all my faves in one xoxo!